How to add a trigger to a scheduled task on Windows 7? 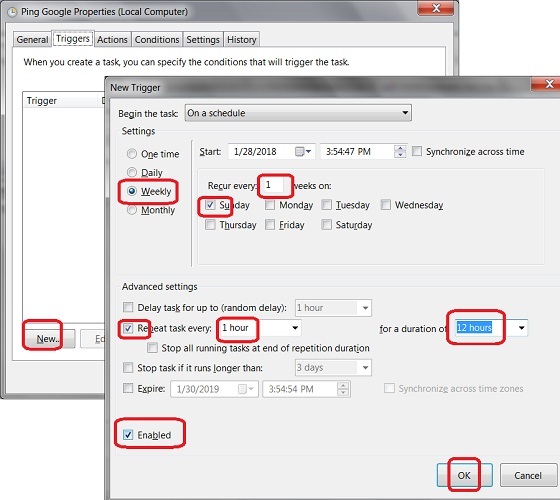 You can follow this tutorial on how to add a trigger to a scheduled task on Windows 7. 1. Open the Task Scheduler. 2. Click on "FYIcenter" folder under the "Task Scheduler Library". You see the "Ping Google" task listed. 3. Double-click on "Ping Google". You see the task properties windows. 4. Click "Actions" tab. You see no triggers listed. 5. Click "New". You see the "New Trigger" windows. [x] Repeat task every 1 hour, for a duration of 12 hours. 7. Click "OK" to close the "New Trigger" window. 8. Click "OK" to clock the task properties window. A new trigger is added to the task now. At 3:54pm every Sunday, the "ping.exe www.google.com" command will be executed. The execution will be repeated every 1 hour for 12 hours.